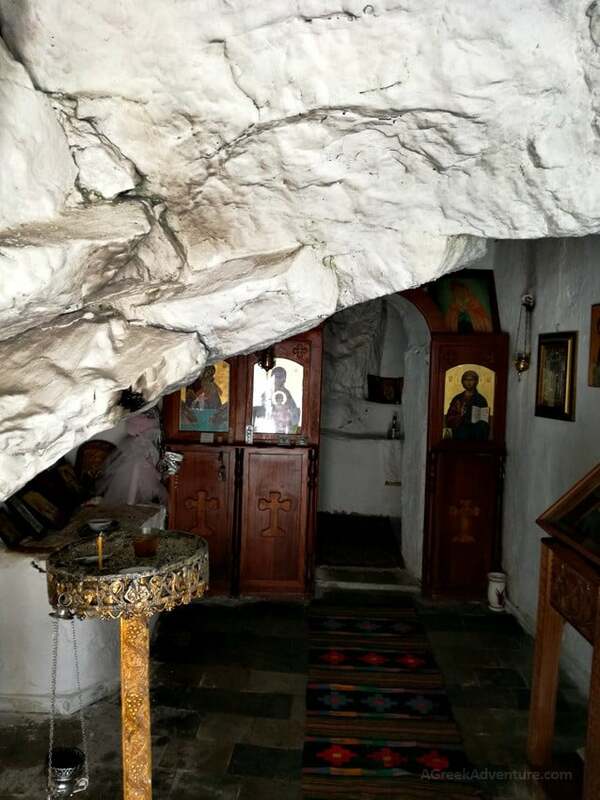 Our travels through Lesvos continue by moving to Agios Isidoros, next to Plomari. 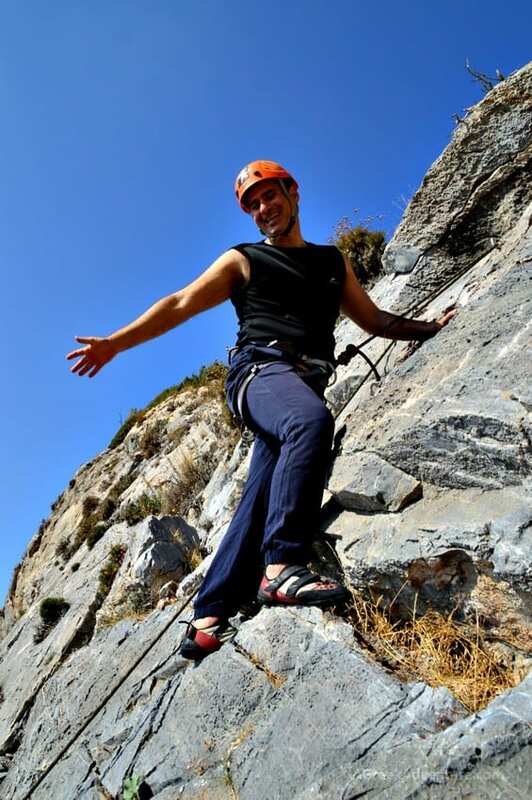 Plomari would be our base for rock climbing with Kostas from Lesvos Climbing & Trekking Club. We had to leave behind the Heliotrope Hotel but before that we had a very nutritious breakfast. Selection of goodies from a huge buffet! 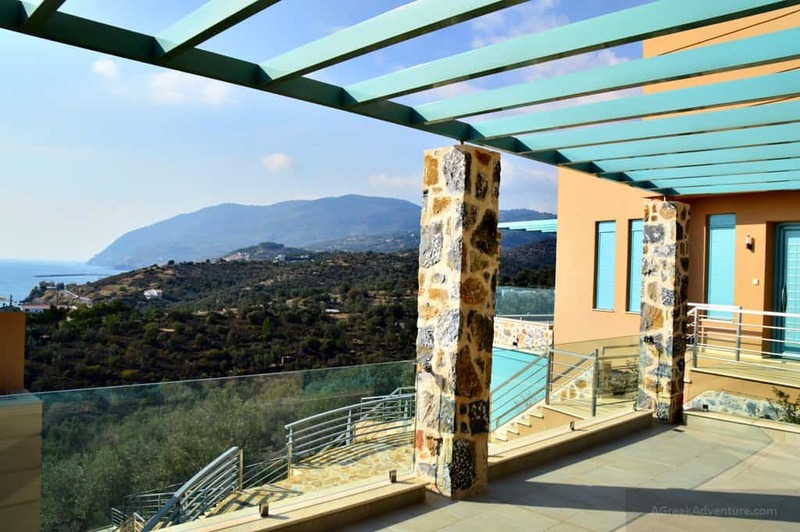 At Plomari, we were amazingly fortunate to stay at a luxury villa complex at Agios Isidoros, called Ouzo Villas. The villa we stayed in was huge. 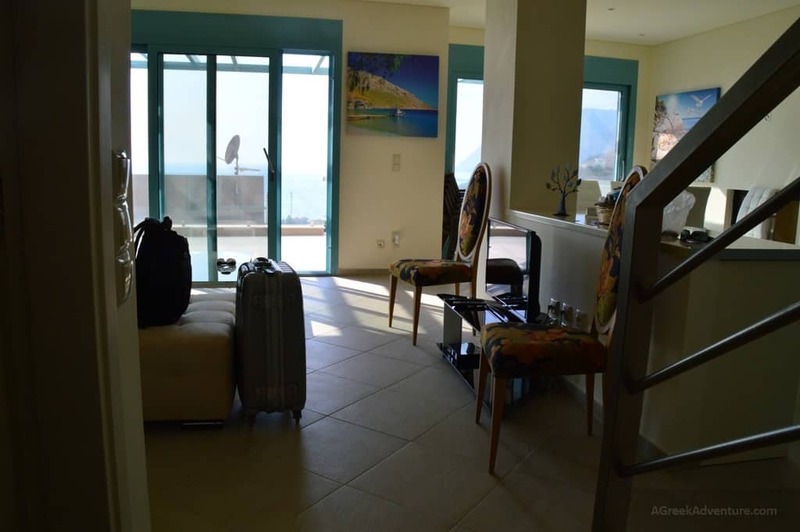 Three floors with every single amenity you could imagine. 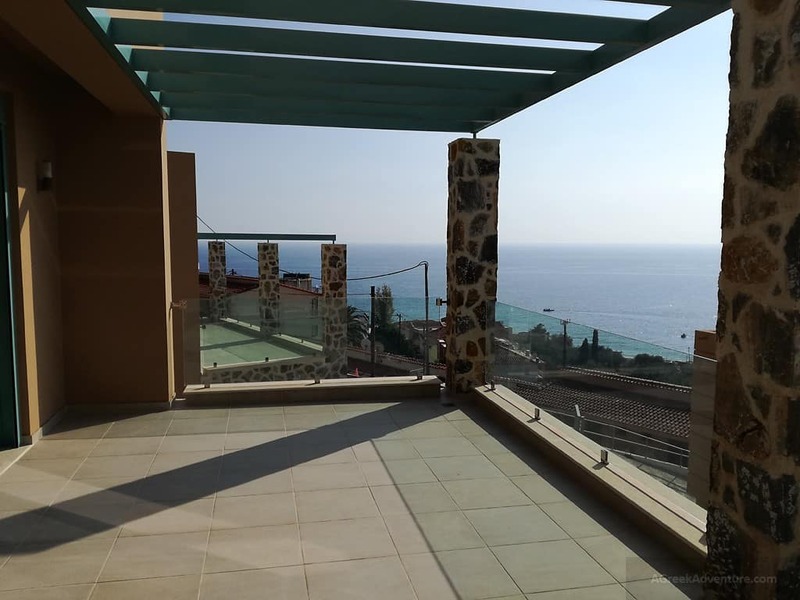 Along that, add a huge balcony with terrific sea view. Having adventures is great when you also return to such comfort. We do fancy a bit of pampering. 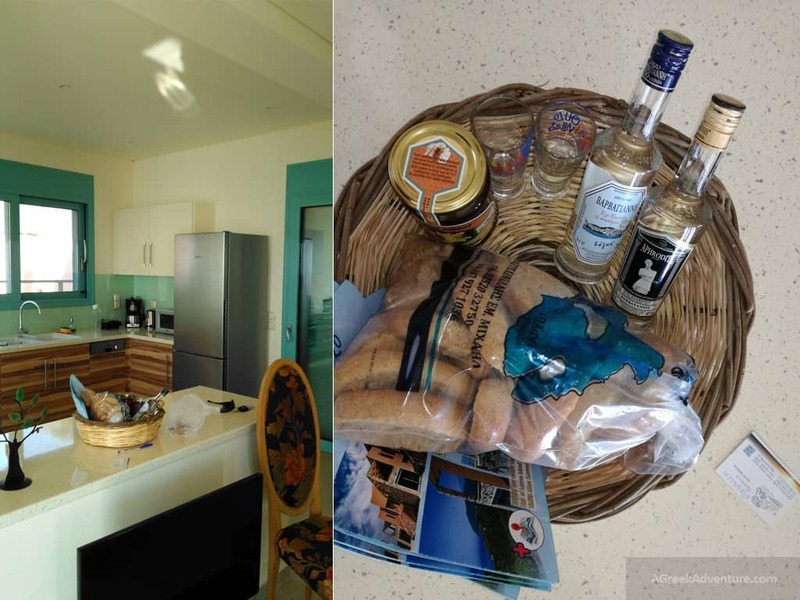 A nice set of ouzo, honey, rusks and more were offered for breakfast. 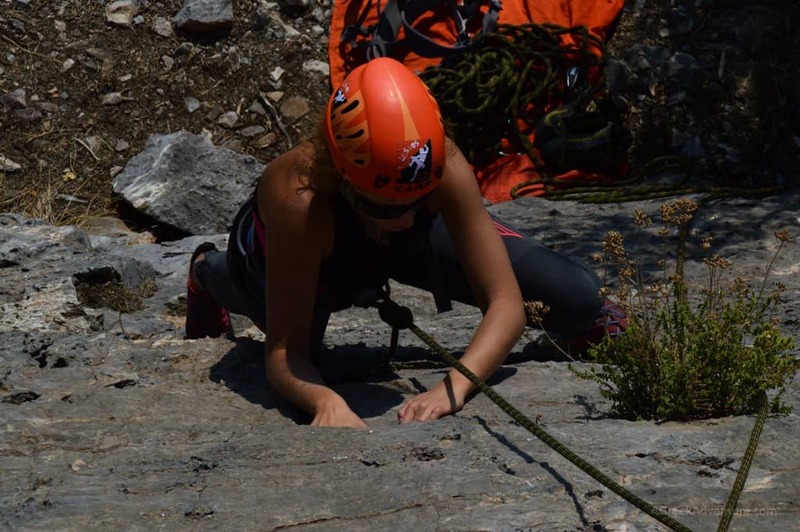 After settling in, we met again with Kostas, our rock climbing guide and certified guide from Hellenic Federation of Mountaineering & Climbing. It was not the first time, we’ve met him at our sailing trip too. So, we knew we would have a great time. 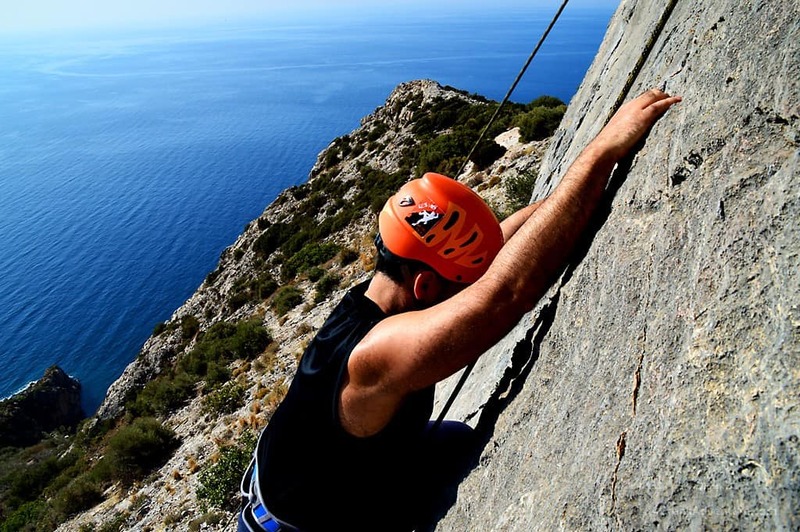 Rock climbing in Plomari is something new for the whole island. 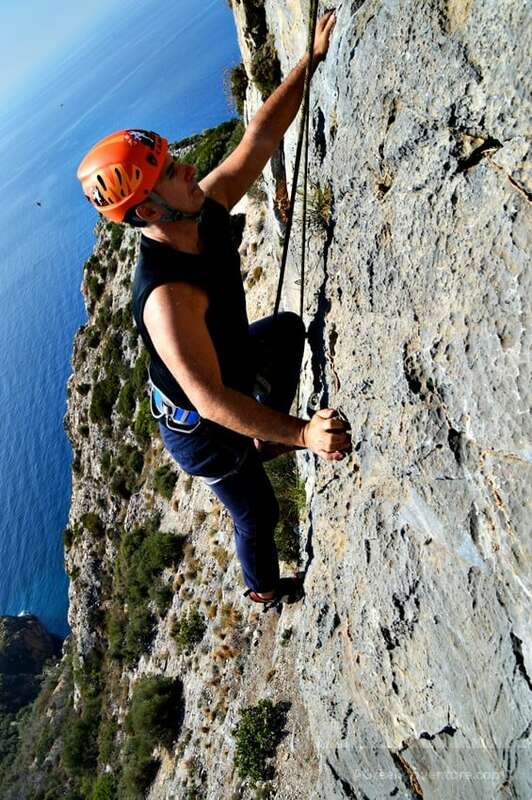 Kostas opened the routes himself, around September 2015. 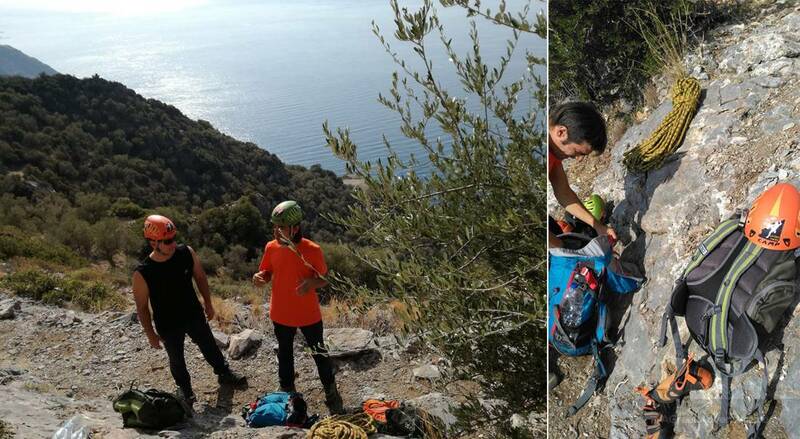 Locals have embraced this extra ordinary extreme activity as it re-introduces the island of Lesvos to new generations of locals along with the island visitors. The climbing field from afar. Looks a bit “short”, right? Well it is not. The field is relatively easy to access through a dirt road. Some driving time is required and then a bit of hiking to get to the routes base. 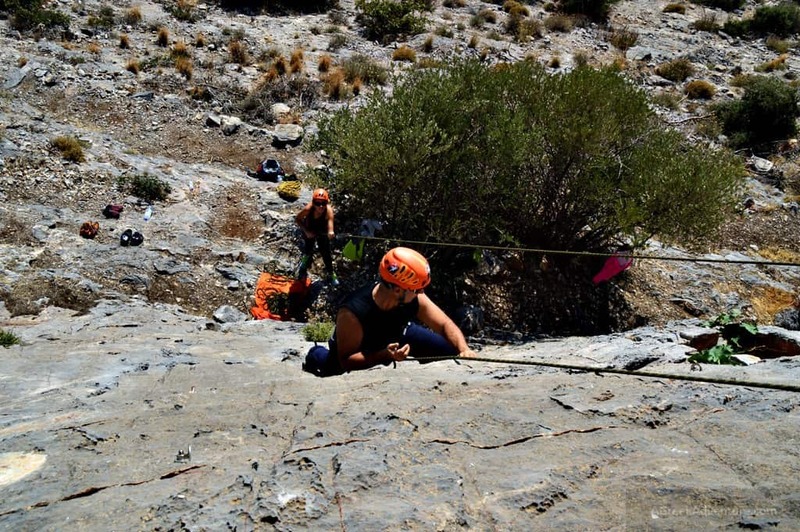 Heading to the climbing field, while carrying ropes, shoes, etc. 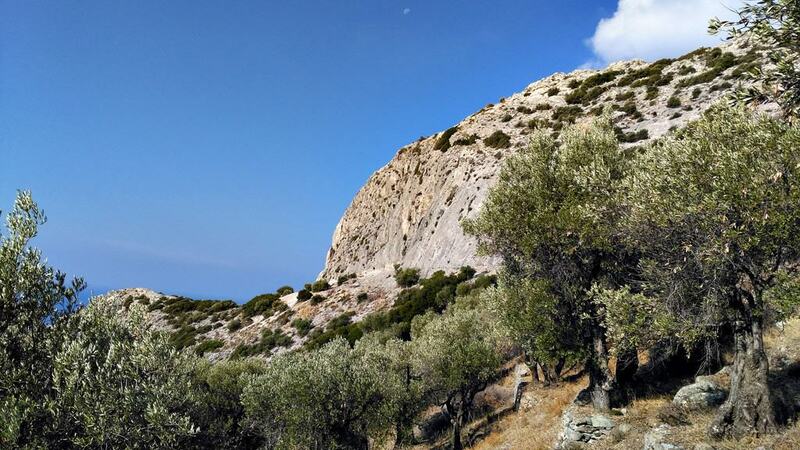 The climbing location is called “Panagia Krifti”, which translates to Hidden Holy Virgin. 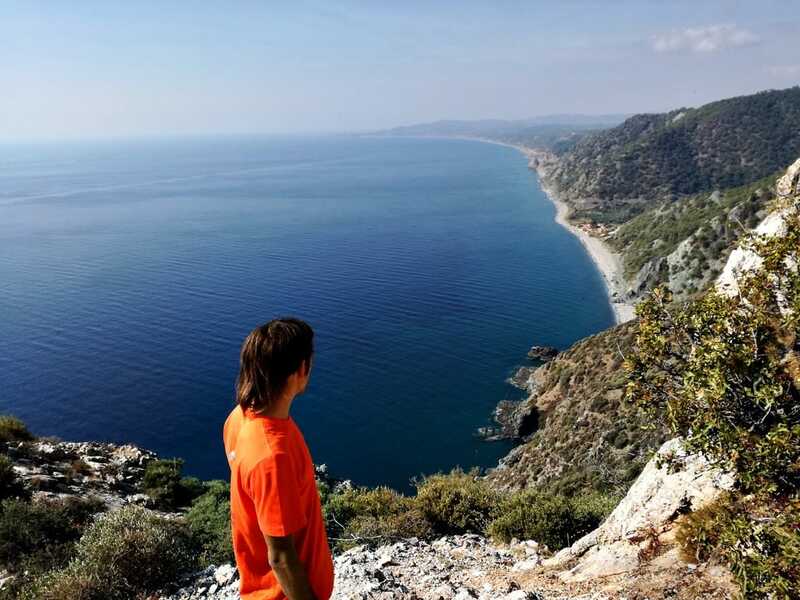 From that location you can see beaches of Lesvos from atop. It is simply magnificent. 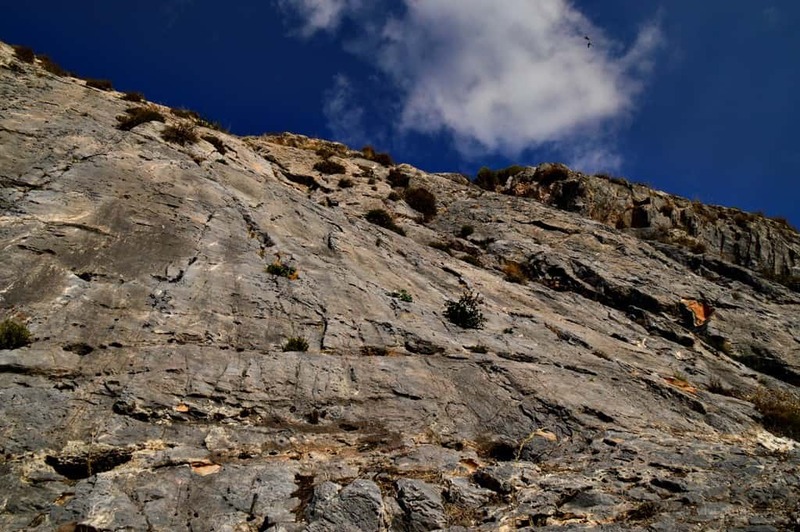 There are 26 routes at that location, ranging from 3 to 6c+. Max height is 25mt and are suitable for novices too. Here is a PDF with many details on the routes for this specific location. Kostas went up to secure the ropes. 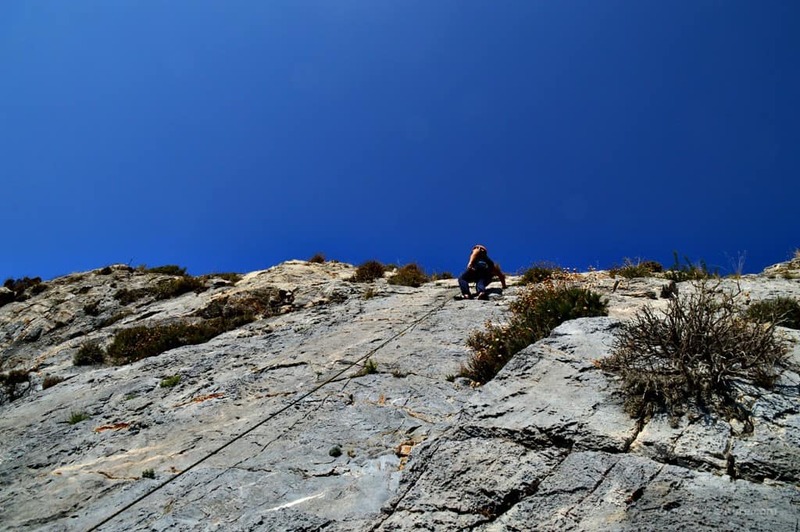 We have done some rock climbing routes before. 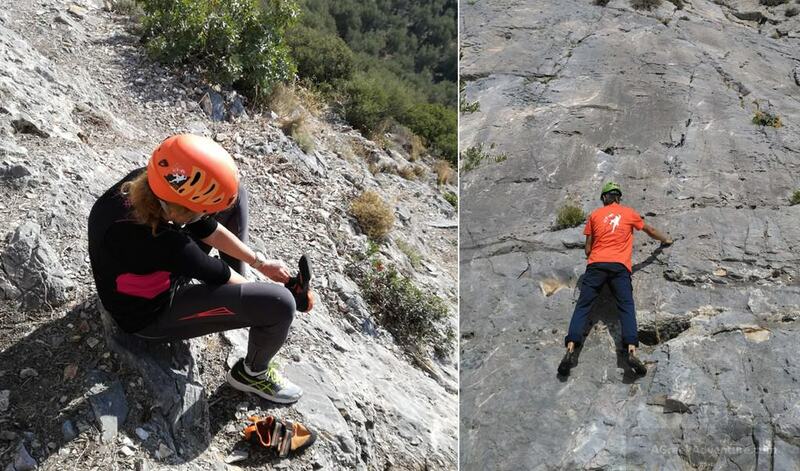 Thus, we were familiar enough with the equipment and safety precautions, in order to simply enjoy the activity. However, Kostas went through all process once more. Kostas brought some pairs of the special shoes we would use. 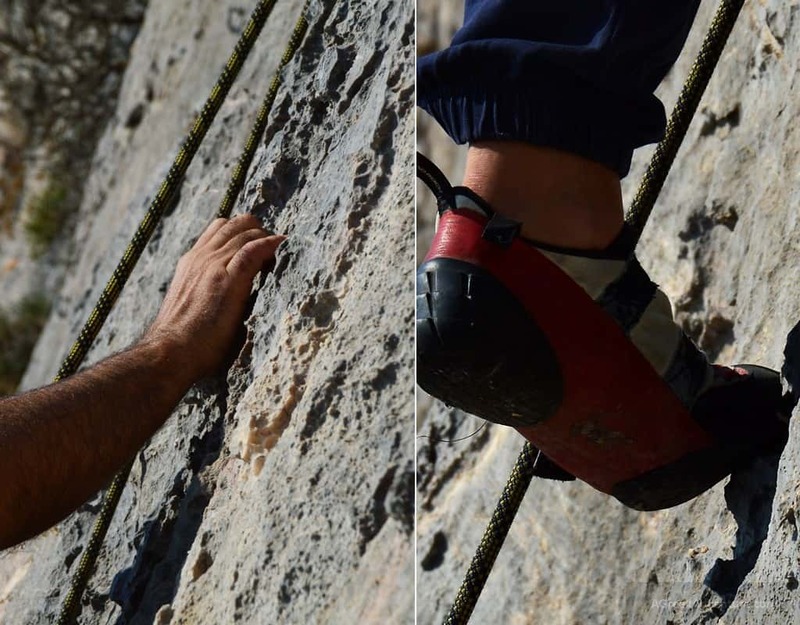 These helped to enjoy climbing better and be safer. Those rocks were either sharp or offering some small grips, or both. Touching one of the the end points! The view from the top of the routes was simply spectacular. Especially, after putting in all the effort needed to climb there. Kostas climbed along to take all these great pictures showing us and this was especially kind from his side. 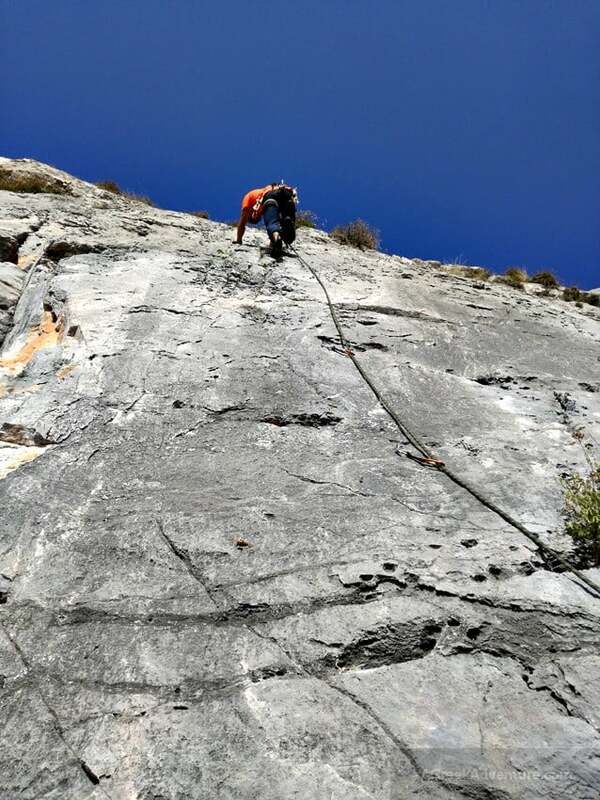 It is very close to the climbing field. It is not so easy to take the car all the way down. It is better to walk all the way to the bottom. The waters and serenity will reward you. An old church resides there. 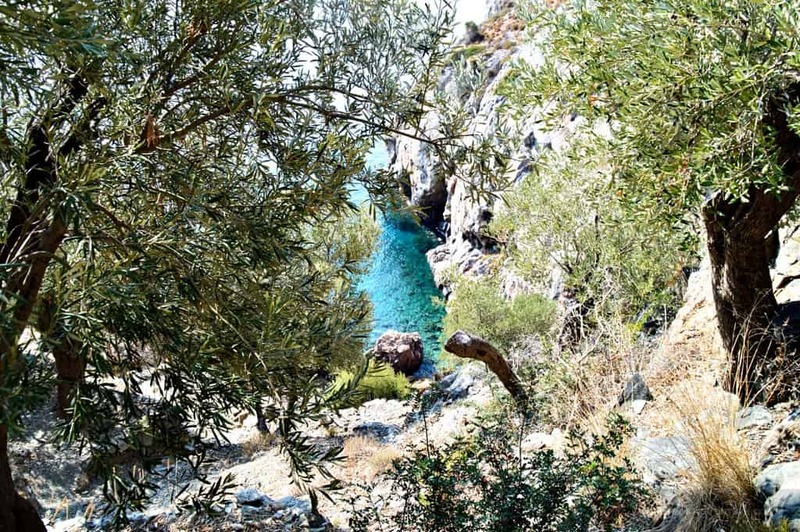 Next to it there is a small dock from where you can jump inside the spectacular bluish waters. This dock/beach is also approachable with a small boat that makes regular trips there. View from church exterior, while chilling out. 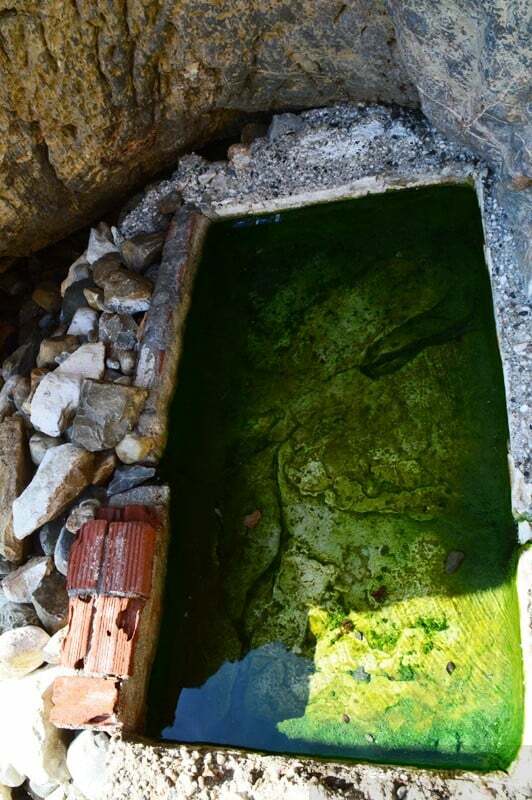 There is a small hot spring there and locals have build a small “hot tub”. The water is extremely hot, far from any hot springs you may know. Usually in most hot springs you can sit in for around 20 minutes. We have been to many and I am not sure I could sit in there for more than 3 minutes. Anyway, there are many hot springs in Lesvos to try from. We just relaxed there looking at the top of the mountain where we climbed a few minutes ago. Kostas decided to take a dive to test the waters! 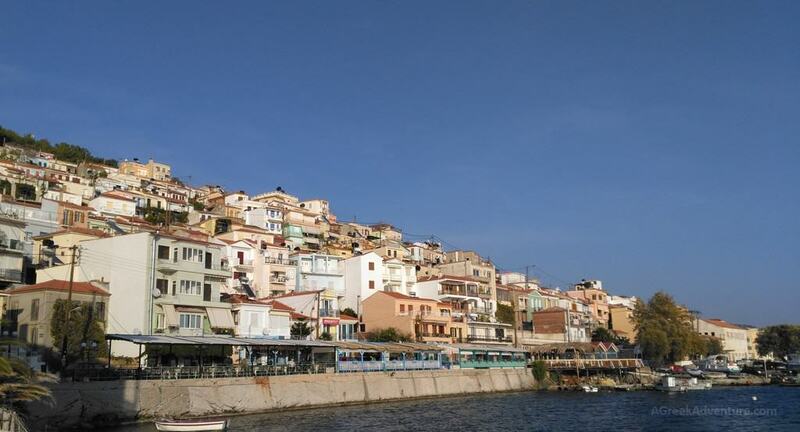 After an hour or so we decided to return to Plomari, so we could change clothes at the magnificent Ouzo Villas, clean up, have some rest and explore Plomari, the “Ouzo capital” of Greece. 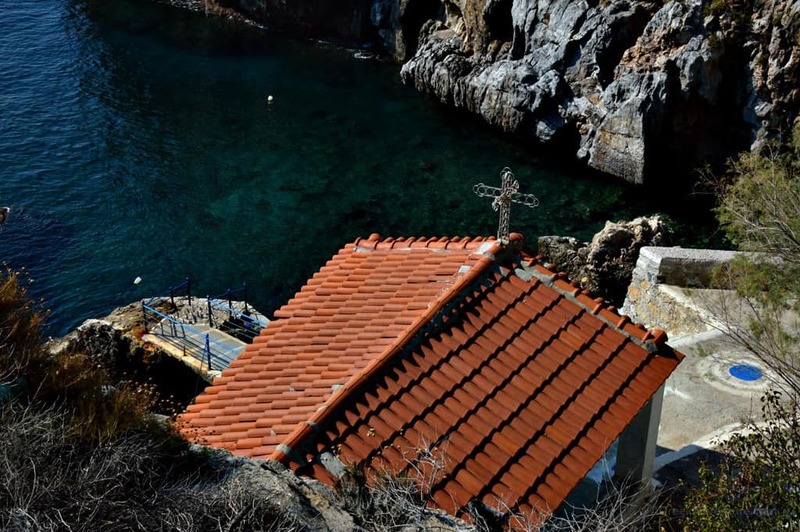 Just a 5 minutes drive (you can even walk it) from Agios Isidoros, is the colorful Plomari. 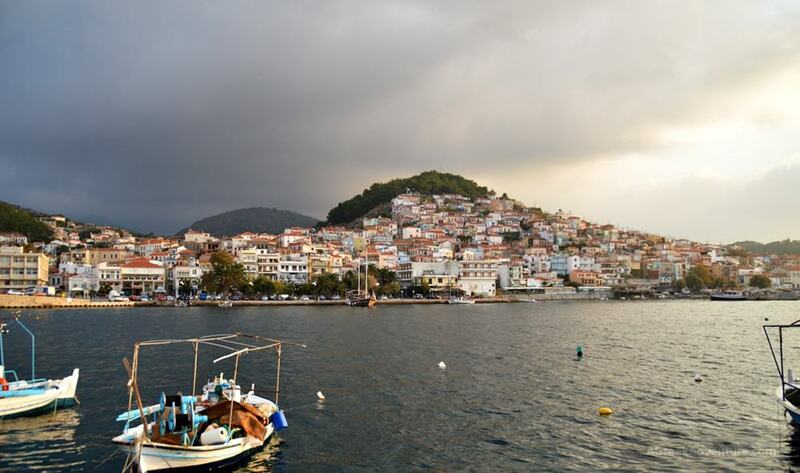 Plomari is famous for hosting all the Ouzo distilleries, for which Lesvos is famous about. We met Menia, a local girl who knows Plomari in and out. 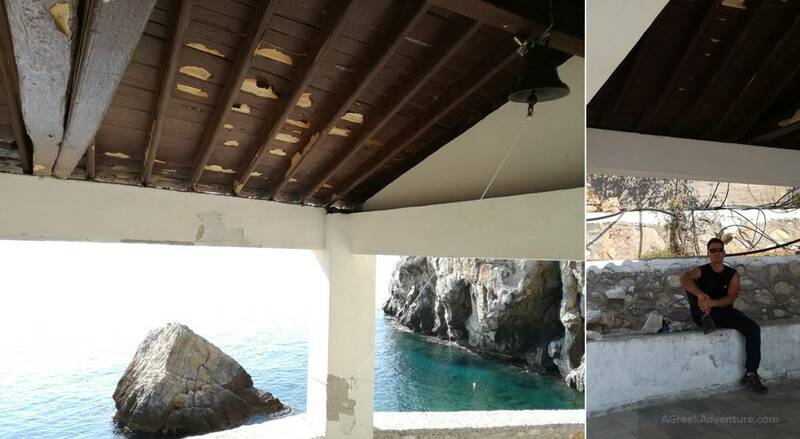 She went us through the small village of Plomari, explaining its history and particularities. We think that what is best to do in Plomari is to walk in the alleys, seeing the old mansions. Do walk up to the temple of Prophet Elias. It is a bit uphill to go there but the view is rather rewarding. Here is Plomari from a harbor viewpoint. Looks fine and fresh but where to put that? Thanks, but where to store this? 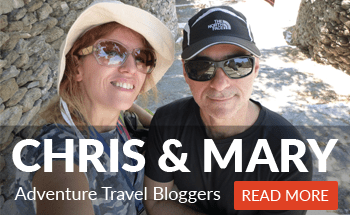 At some point, and after all the climbing and walking around, we started craving for local food, so we asked Menia to point where we should eat in Plomari. There are some pretty nice taverns at this area below, as seen from the harbor. 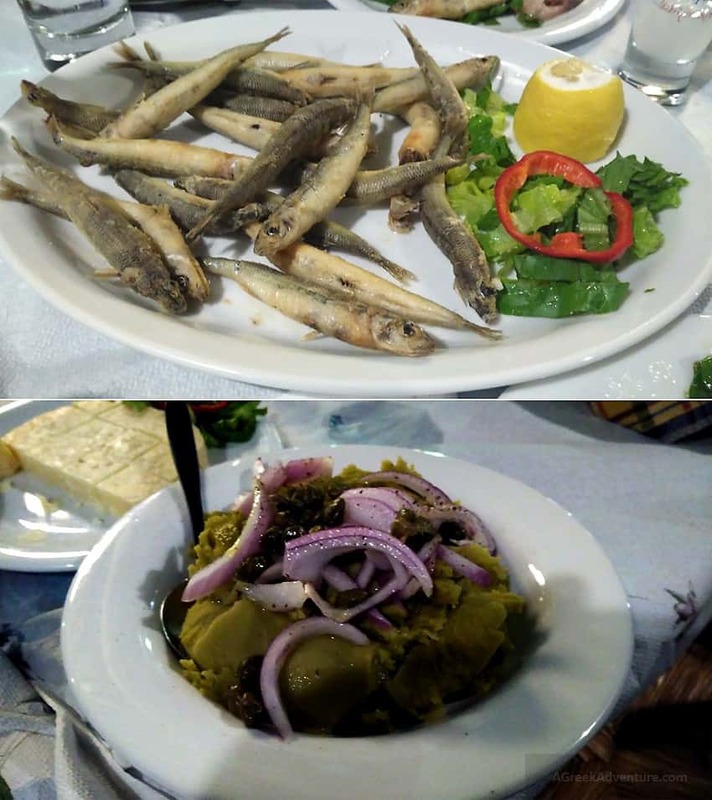 Menia mentioned the “7 Seas” tavern in Plomari, for some great seafood, salads, local “oil cheese”, another variety of ouzo and salted fish. 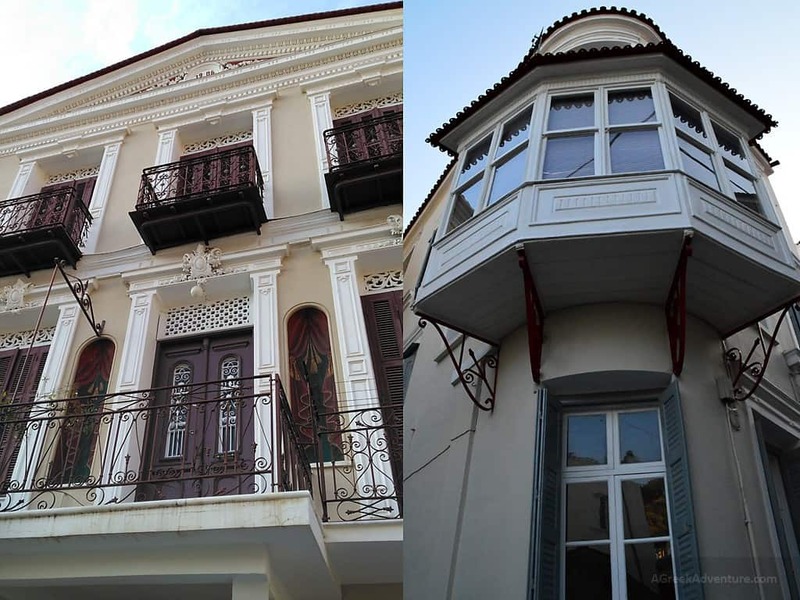 One thing we noticed in Plomari and in Lesvos in general! 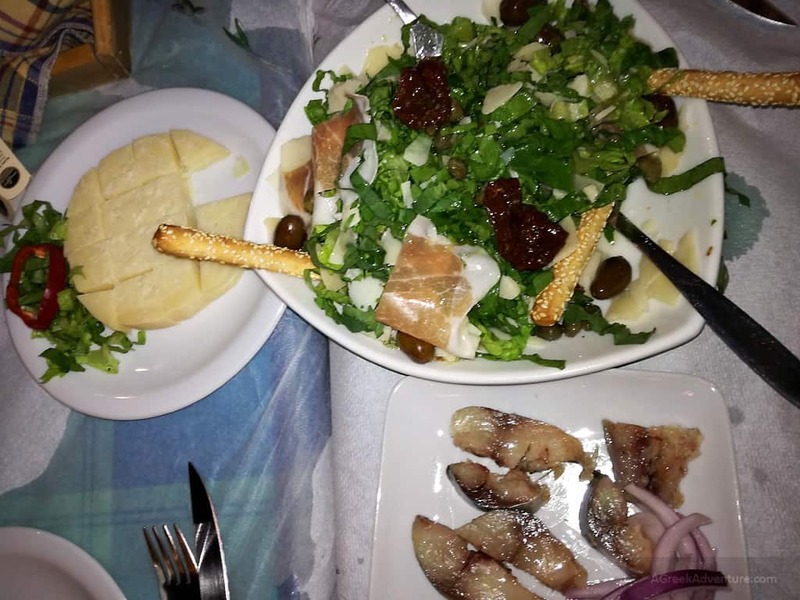 We were consuming ouzo and eating a reasonable amount of a variety “mezedes” every day. Not even once we felt like over-eating or having a heavy stomach or any kind of discomfort. 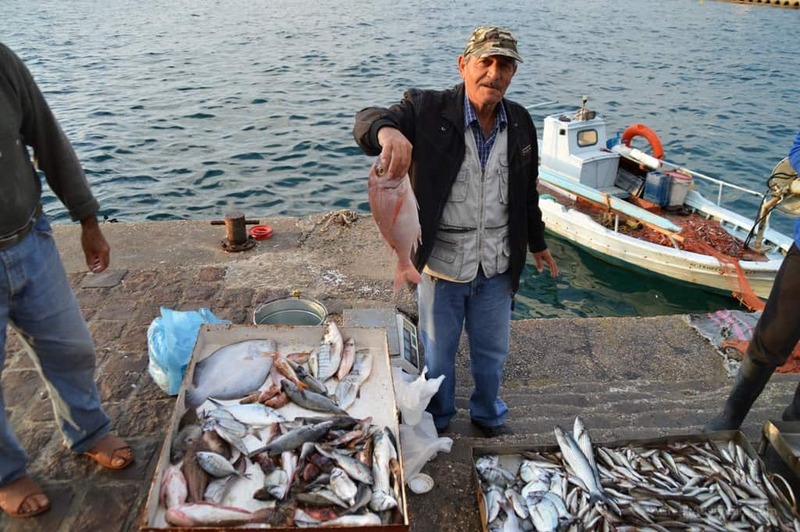 We asked the locals about that and they said that in almost all taverns, they are very careful with how they cook the food by using very good quality ingredients. 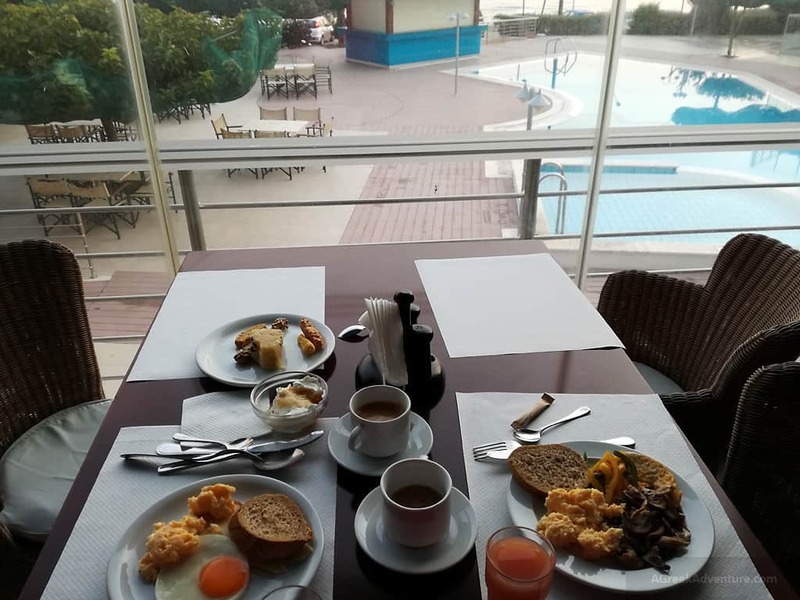 We stayed at “7 seas” there until late night, by the sea, enjoying a perfect closing of a perfect day that had it all: rock climbing, sightseeing, great food, great company of people. As we have said many times: When in a place, ask the locals. They will point out to anything you need to visit or eat. 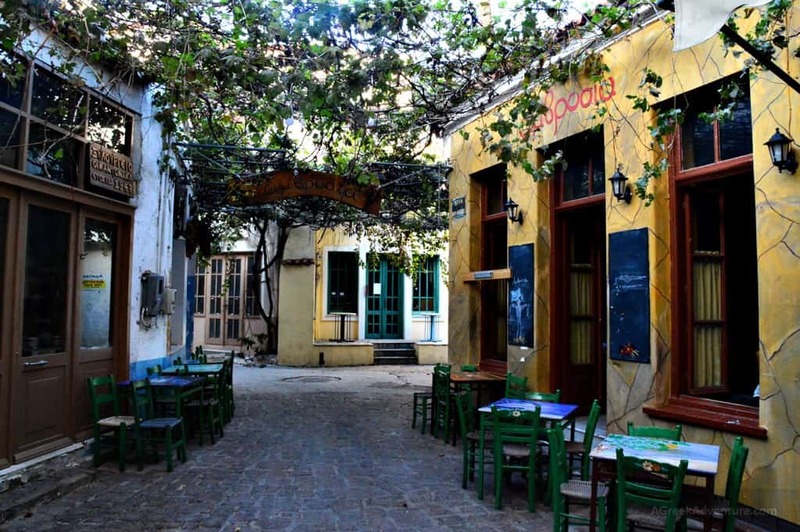 Stand by for our next adventure in Lesvos. 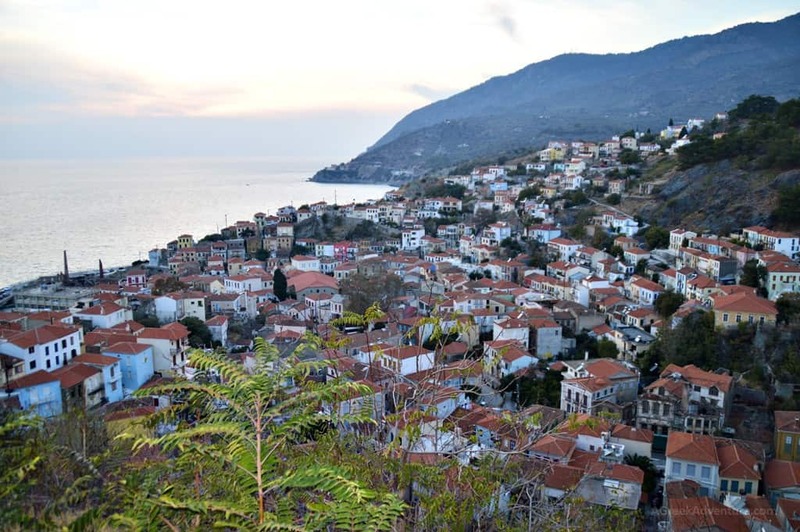 Hint: Horseback riding, hiking and walking around through the famous Molyvos. 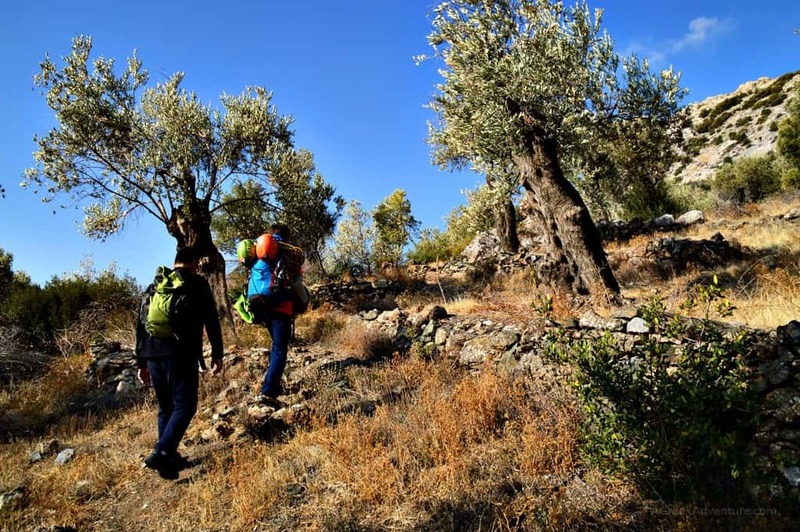 Disclosure: The trip was organized by the District of North Aegean Tourism department, along with a series of activities, accommodation and dining providers mentioned in our articles. Airplane tickets provided by Astra Airlines. As always, all posts are written according to our experience and opinion.